Legate Constantius Tituleius is an Imperial soldier who can be found in Pale Imperial Camp. Should the Imperials take control of Dawnstar he will move to the White Hall. 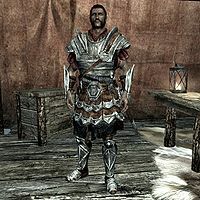 He wears a set of Imperial armor with a matching pair of boots and bracers. In close combat, he relies on an Imperial sword or a steel dagger. He uses an Imperial bow for ranged attacks with 12 steel arrows for ammunition. He also carries his sleeping outfit, a belted tunic. This page was last modified on 30 December 2013, at 13:19.